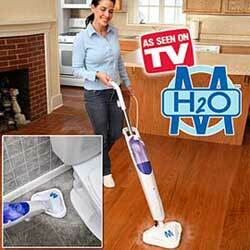 H20 Mop™ - Clean Your Floors with the Power of Steam! The H20 Mop™ harnesses the dirt-devouring, super-sanitizing power of steam to get your floors clean with almost no effort at all! The steam pressure loosens dirt while the super-absorbent microfiber pad scrubs and lifts it away. H20 Mop’s arrow swivel head and super long 15’ cord lets you deep clean anywhere. Plus, it easily converts to a carpet steamer, so you can clean and refresh your carpets and rugs without renting an expensive steamer. Includes 2 washable microfiber pads and Carpet Glider.